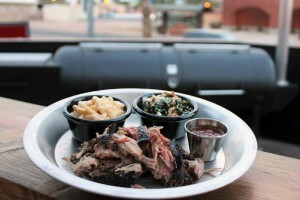 Smokehaus, the latest BBQ Restaurant to hit downtown Scottsdale, is hosting a grand opening party on Wednesday, February 24th from 6-8 p.m. to benefit the Honor Flight Network. The public is invited to come and celebrate the grand opening, which doubles as a fundraiser for the Honor Flight Network with a goal of raising $5,000 to send five WWII vets to Washington DC this Spring. The Honor Flight Network is a non-profit organization created to honor America’s veterans. Donations to the organization help transport veterans to Washington, D.C. to visit memorials that recognize the sacrifices and accomplishments of soldiers who fought during WWII, The Korean War and The Vietnam War. During the grand opening, guests can come and enjoy a limited menu of signature dishes, with a percentage of the proceeds benefiting the Honor Flight Network. Prepared on the famous Camelback Smoker, be sure to try Smokehaus’ claim to fame, the Santa Maria Tri-Tip Sandwich, which is hand rubbed, cut thick and served on a grilled French roll. Smokehaus is located right next door to Brat Haus at 3636 N. Scottsdale Road, Scottsdale, AZ 85251. For more information, visit: http://smokehausaz.com. The Smokehaus menu draws inspiration from the rich tradition of central coastal California’s Santa Maria grilling style. Smokehaus’ method includes slow smoking meats and grilling them on a traditional Santa Maria grill over an open flame with mesquite and oak wood for a rich and unique flavor. Located in the heart of old town Scottsdale, Smokehaus is the sister restaurant to Brat Haus and newest addition to the booming Arizona BBQ scene. The menu is packed with finger lickin’ good eats and throwback drinks. The large indoor dining room includes cozy booths, a full wrap around bar and large picnic tables for groups small and large. Out on the patio, enjoy the beautiful Arizona weather and the sweet aroma of our Camelback smoker and Santa Maria grill. Smokehaus is located at 3636 N. Scottsdale Road, Scottsdale, AZ 85251. For more information, visit http://smokehausaz.com.